BW883-E6 wireless door lock offers the latest Radio Frequency Identification (RFID) technology and intelligent cloud platform to give guest more convenience and improve operational efficiency. 1. Wireless RFid lock BW883-E6 is our luxury mode. With long-distance control function, BW883-E6 is very easy to use. 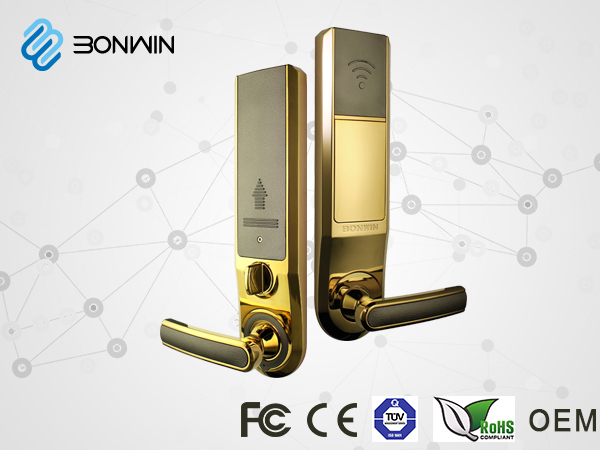 BW883-E6 is Bonwin wireless lock that a card has many application.. The batteries of BW883-E6 can use 12 months. ◎ Integrate easily, BW883-E6 wireless network lock provides COM+ technology interface and a test DEMO program, making the ordinary Wifi, Bluetooth, mobile phones and walkie-talkie completely staggered to avoid interference with the lock communication. ◎ All need in on card: The card of BW883-E6 hotel RFid lock can open door lock, the elevator and others, which is much more convenient for more customers. ◎ OPENA software, BW883-E6 has been successfully docked with OPENA software, which makes the hotel lock system run better.